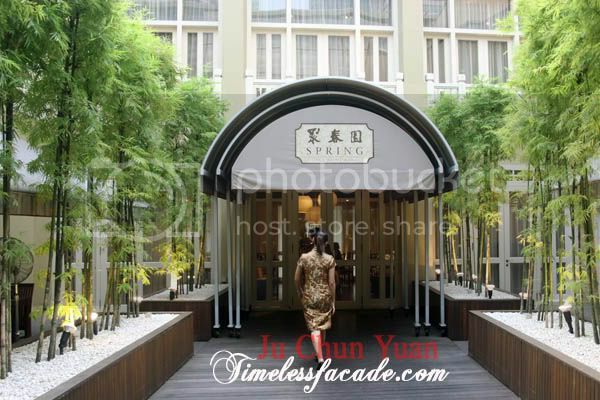 Spring Ju Chun Yuan - a collaboration between Far East Hospitality and Ju Chun Yuan, which is known for its Fuzhou cuisine in China. 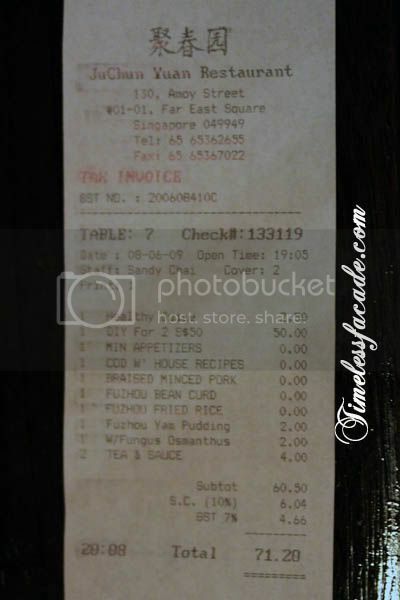 Apparently the boss of Far East ate at the restaurant in China and was so impressed by the food that he decided to bring it to Singapore, lock, stock and barrel with no modifications done to suit the Singaporean palate. And Ju Chun Yuan's claim to fame? 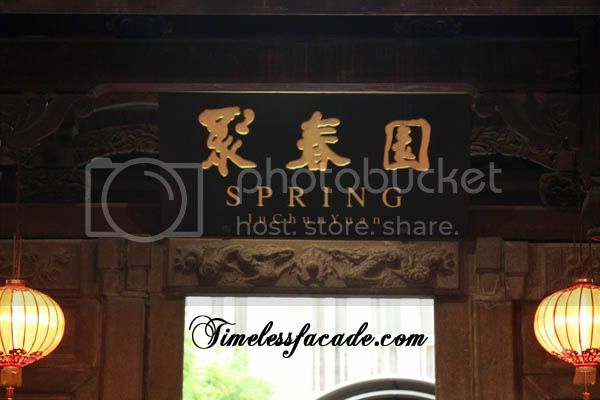 It's purportedly the birth place of the extremely pricey and decadent "Buddha Jumps Over The Wall" (佛跳墙). 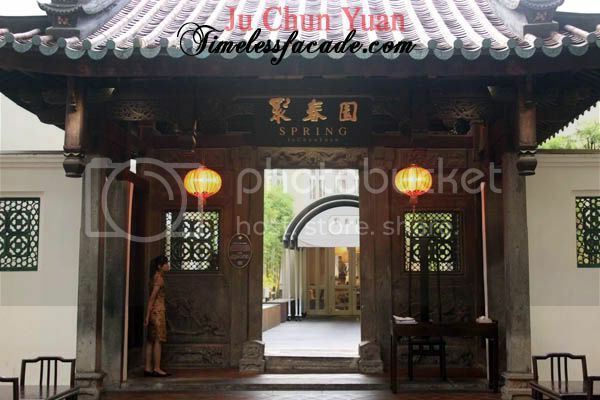 Aptly located at Far East Square, Ju Chun Yuan is housed in a conserved Chinese courtyard complete with traditional frontage and a tiled roof from ancient Chinese times as well as bamboo shoots flanking the walkway that leads to the restaurant. 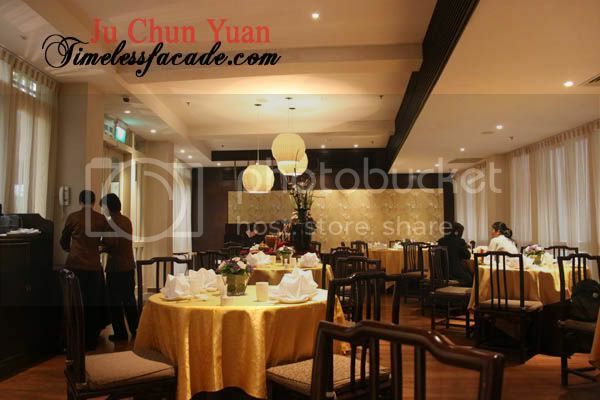 The interior however, is modern Chinese with a touch of class and sophistication. 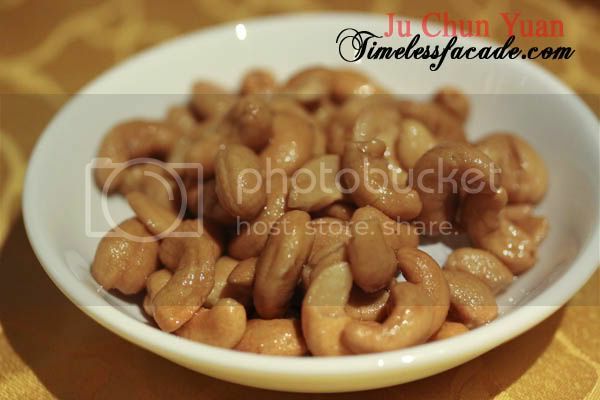 The first of the three delicacies - Cashew nuts lightly coated with sugar to give it a mild sweetness and sheen. Nice and crunchy and I happen to have a weakness for cashews so this suited me just fine. 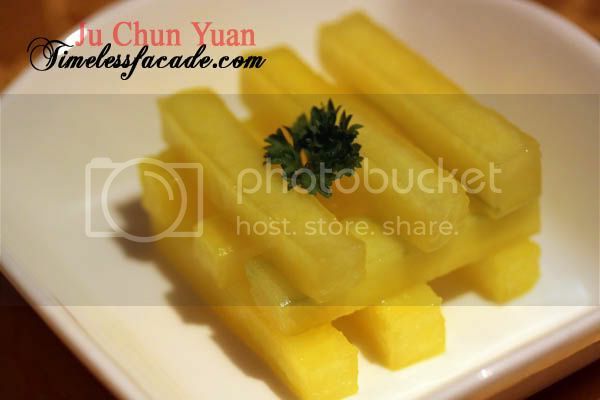 The second delicacy was essentially winter melon strips dipped into orange syrup. The strips had a nice crunch and tasted mildy sweet with a zesty tinge of orange. Great as a snack. 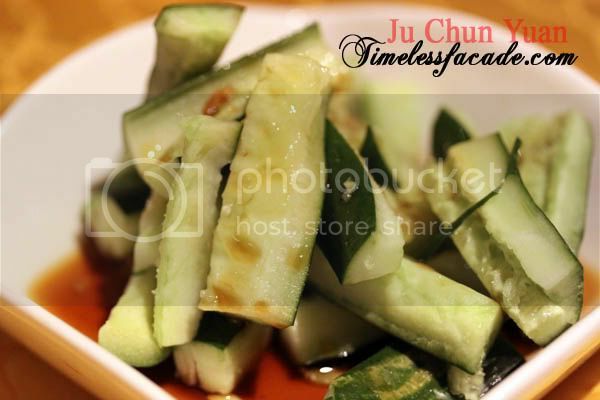 Third was the cucumber slices that had a mild and sharp spicy taste to it. Not a big fan of cucumbers though, so I didn't venture past my first piece. According to the waitress, the house recipe contained about 10 different spices in it and I was sold, especially when you throw cod fish into the equation. But honestly, it didn't quite pan out as expected. Sure, the sauce was mildly sweet and very light but the batter coating on the fish slices was a little too thick and I couldn't quite make out the texture of the cod nor the sweetness of the flesh. Disappointing. Beancurd is comfort food to me and I like it done in any way, well almost. 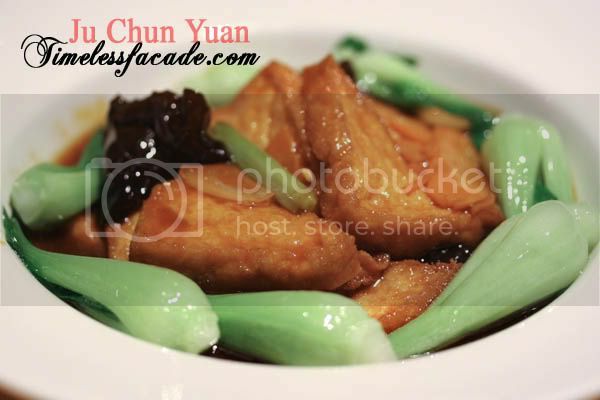 I don't exactly know what fuzhou style tofu entails but this dish tasted like normal braised beancurd (红烧豆府) to me. Average but edible. I opted for this dish because I was intrigued by lychee, water chestnut and minced pork together in 1 dish. It turned out to be a most unwise decision. 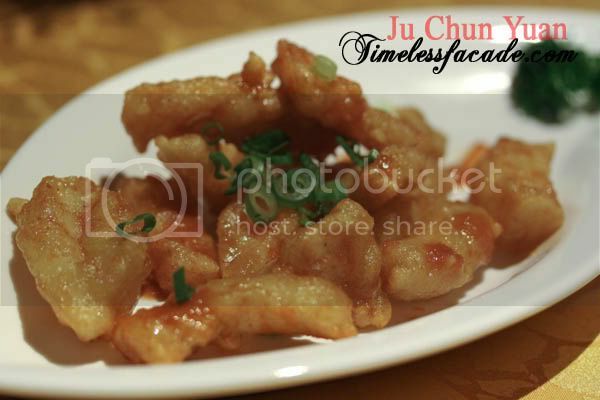 For starters, the minced pork comprised mostly fatty pork and carried an overwhelming pork taste. 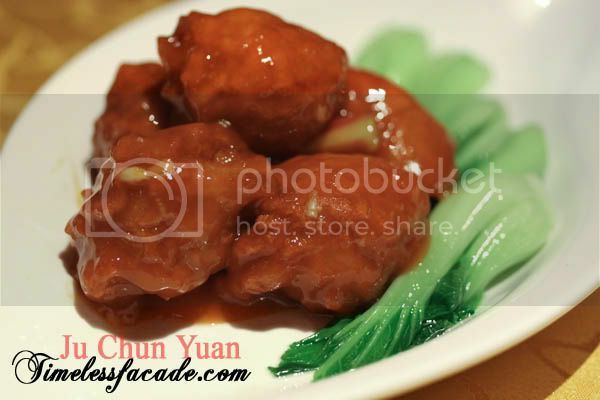 The lump of chestnut in the center of the meat ball added a nice crunch to it while the drizzled sauce tasted sweet, very much like those you would find on sweet and sour pork (咕噜肉). There was no taste of lychee whatsoever. As aesthetically pleasing as the fried rice looked with its homogeneously egg coated grains of rice, it fell short in taste. There was no discernible wok hei taste and the whole dish lacked any flavour to the extent of being bland. 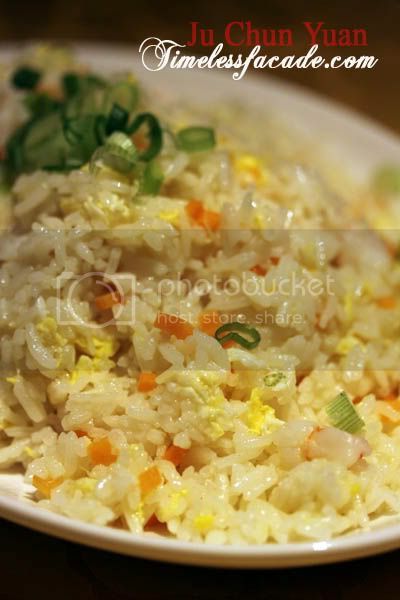 Still edible though as the rice was soft and moist with reasonable servings of chopped prawns and other condiments. One thing I realised was that the rice seemed more steamed then fried. The restaurant probably steamed it for quite a bit before doing a fast fry with minimal oil. A light and sweet cold white fungus dessert with floral connotations from the osmanthus to end off the disappointing meal. As average as it gets. I had been dying to try out Ju Chun Yuan's rendition of my favourite dessert, yam pudding, ever since it was billed as one of the best by local media sometime back. On hindsight, I should have known about the overhyping that plagues most local media these days. 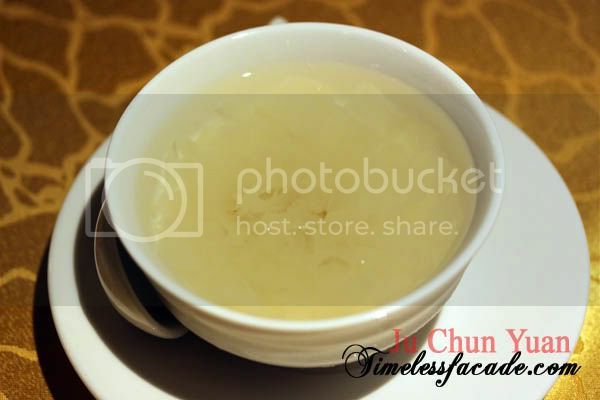 Though the yam pudding was smooth, it retained little moisture, making it a tad dry. It wasn't fragrant either, probably due to the minimal or lack of lard. What was different was the addition of sesame seeds, which really boils down to personal preference. Dinner for 2 cost to the tune of $71, which isn't expensive for the quantity and variety of food. However, quality is suspect, which does make $71 seem a little over the top. To be fair, it may be because I am not used to authentic Fuzhou cuisine like the way they do it in China? Either that, or they really need to work on their food. haha the Buddha Jump Over the Wall is out of my budget. 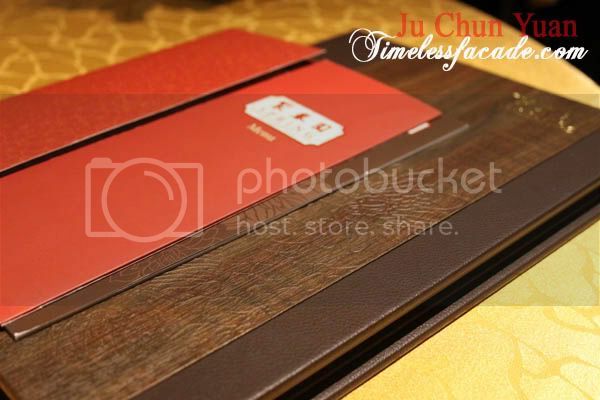 The cheapest one is $78++ for a 1 person serving and that doesn't come with shark's fin. The one with shark's fin costs $98++. Madness!